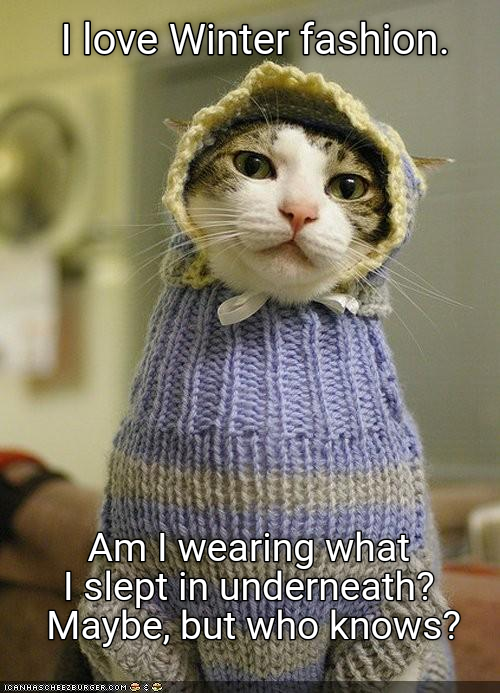 There is no limit to the cat funnies on the internet. Makes my life complete. If this widget does not appear, click here to display it. Thank you for visiting and taking the time to comment. It means so much. This blog is Award Free. I appreciate your thinking of me for an award, but please know that your comments are my award. Thank you! I love that collection photo, it's what our house looks like every time we move furniture! OMG! So funny! 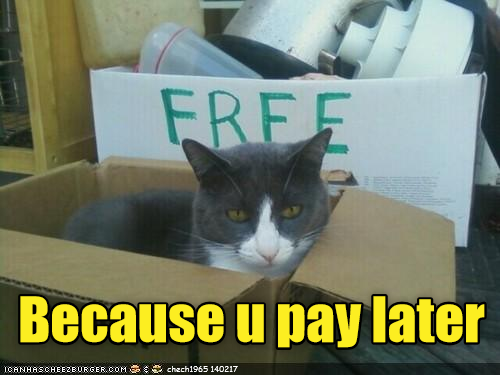 Especially Free cuz you'll pay later! Ha HA! 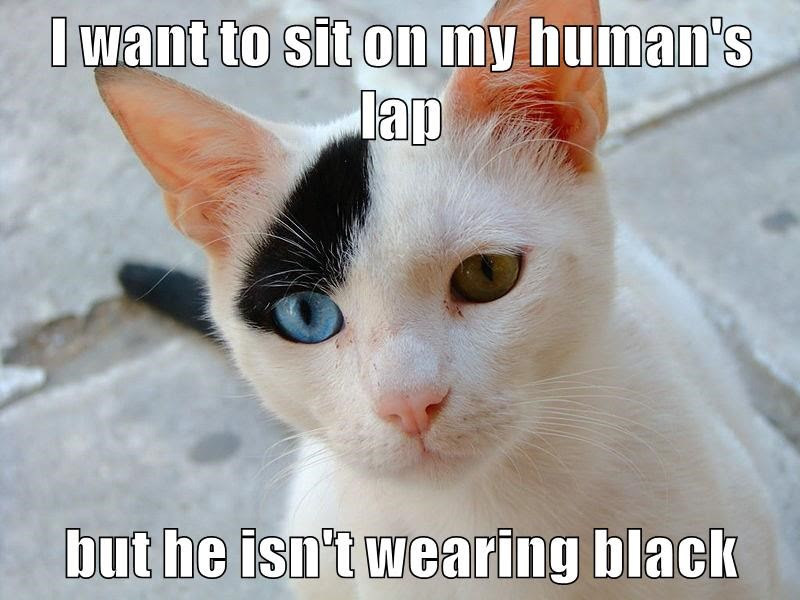 We love the interwebs. Happy almost birthday to your babies! 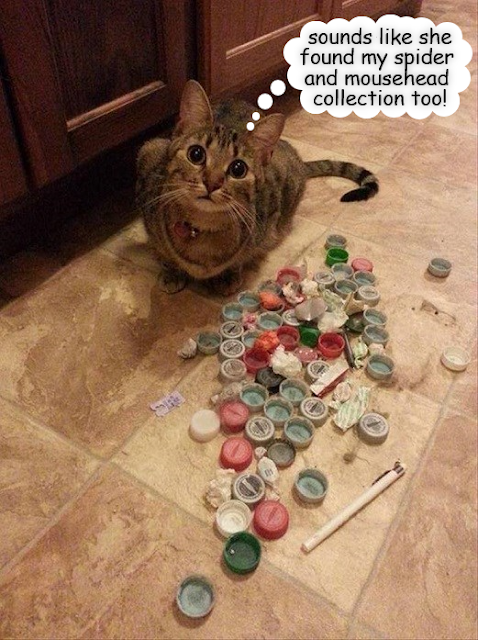 The bottle cap hording kitten reminds me of my cat, lol. He has quite the collection going for himself. So cute. 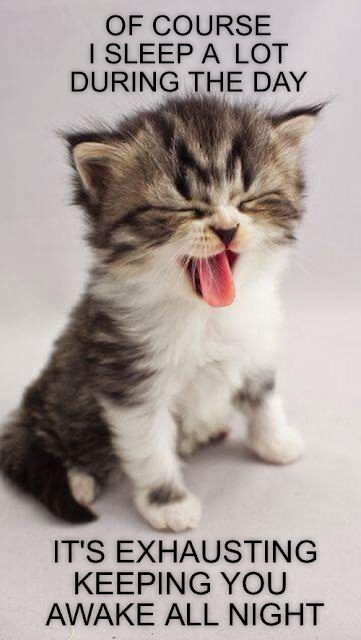 Oh my goodness, that kitten with their little tongue peeking out .... so cute. Michelle has read 0 books toward her goal of 75 books. If books could have more, give more, be more, show more, they would still need readers who bring to them sound and smell and light and all the rest that can’t be in books. #TuesBookTalk - Join us on Goodreads & we now chat on Slack! Share book reviews and ratings with TuesBookTalk Read-a-Longs, and even join a book club on Goodreads. image source: Kirsty Mitchell's "Wonderland"
Which Jane Austen heroine are you? Which literary heroine are you? You are Josephine March from "Little Women" by Louisa May Alcott. Opinionated and outspoken, your bold nature can sometimes get you into trouble. You must constantly make a conscious decision to seem gentler to people when you first meet them -- those who do not know you well can sometimes find your passion abrasive or overly aggressive. The happiness of others is your greatest source for happiness of your own -- you want nothing more than to provide for your family and friends, to make them happy. Which Downton Abbey Character Am I? You are Lady Sybil Crawley. The youngest daughter of Lord Grantham, you’re compassionate, strong, and really concerned about social justice. You’d also like to be able to vote. The bravest and most idealistic member of your family, you’re the most likely to end up at a political rally, try and help a servant to a better job, or scandalize your sisters by wearing pants to a party. Which historical person are you most like? You are Boudicca, Queen of the Iceni people and fiery leader of an uprising against the Romans in England. You don’t turn away from a fight. In fact, you go looking for one if someone tries to tell you what to do. You’re a natural leader, a vicious opponent, and you look great swinging a sword. Who would I be in 1400 AD? You scored 34% Cardinal, 44% Monk, 38% Lady, and 57% Knight! You are the hero. Brave and bold. You are strong and utterly selfless. You are also a pawn to your superiors and will be lucky if you live very long. If you survive the Holy wars you are thrust into you will be praised for your valor and opportunities both romantic and financial will become available to you. Which classic dame am I? You scored 21% grit, 24% wit, 52% flair, and 19% class! You are the fabulously quirky and independent woman of character. You go your own way, follow your own drummer, take your own lead. You stand head and shoulders next to your partner, but you are perfectly willing and able to stand alone. Others might be more classically beautiful or conventionally woman-like, but you possess a more fundamental common sense and off-kilter charm, making interesting men fall at your feet. You can pick them up or leave them there as you see fit. You share the screen with the likes of Spencer Tracy and Cary Grant, thinking men who like strong women. Find out what kind of classic leading man you'd make by taking the Classic Leading Man Test. You’re smart and funny, and underneath it all, you have a strong compassionate streak. You may have a crazy temper, but you’re an asset to the Doctor all the same. True Book Addict claims no credit for any images posted on this site unless otherwise noted. Images on this blog are copyright to its respective owners. If there is an image appearing on this blog that belongs to you and you do not wish for it to appear on this site, please contact me via the contact form in the menu above with a link to said image and it will be promptly removed. The True Book Addict by Michelle Miller is licensed under a Creative Commons Attribution-NonCommercial-NoDerivs 3.0 Unported License. I do not accept payment in exchange for a review or for the mention of a book unless otherwise noted. My thoughts and opinions expressed in reviews on this site are in no way influenced by receipt of free review copies from authors, publishers, publicists, or book tour companies.